In a surprising move, HMD Global announced that its flagship, Nokia 8 will be updated to Android 8.1 Oreo very soon. For the time being, owners of the smartphone can download the first Android 8.1 Oreo beta build released by HMD and send their feedback to help make the update bug-free. Those who want to try Android 8.1 Oreo before the Finnish company releases the stable version can join the Beta Labs Program, which does not seem to have a limited number of spots. 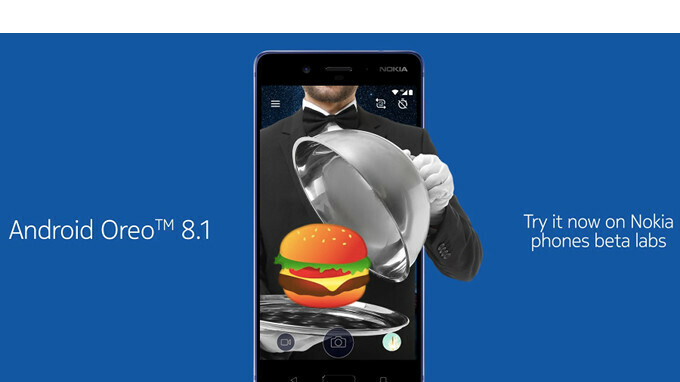 HMD Global's Chief Product Offices, Juho Sarvikas, confirmed Android 8.1 Oreo beta will bring a host of new features to the Nokia 8. Jokingly, he also announced the update includes the hamburger emoji fix that many have complained about after Google released Android 8.1 Oreo to Nexus and Pixel devices. If you plan to test the new version of Android on your Nokia 8, you'll probably find even more interesting features that have been mentioned by HMD's official. Just don't forget to join the Beta Labs Program if you like testing new software. It strange but... 16:9 aspect ratio phones are starting to look outdated since February 26th, 2017. Now what happened on that 'glorious' day, eh? Google it! In any case; I think next year; I'll probably dismiss anything that doesn't have an screen embedded fingerprint scanner! Or... Variable aperture. Or perhaps also a 120Hz Display! Ah! But at the same time; I wonder whether I've enough breaths in my chest to make it past 2018! Good question, eh? G'Day! If you feel you haven't enough breathe to make it past 2018... You should seek God's help..